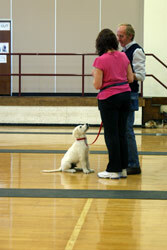 Our puppy classes are potentially one of the most beneficial of all our group training sessions. As with most things prevention is better than the cure. And most dogs will develop into a much better companion if rules and social skills are instilled from an early age. The majority of owners come to us for help with older dogs because their dogs have not turned out the way they had hoped. Most lack the social skills to mix with other dogs, and many have had few boundaries set in respect of their general behaviour. My advice to anyone with a puppy is to stop hoping your little bundle of fun will turn out ok, and take steps to make sure they do. That is the basis of our puppy classes. To give owners the opportunity to socialise their puppies with dogs of a similar age and to explain the importance of setting some early ground rules. 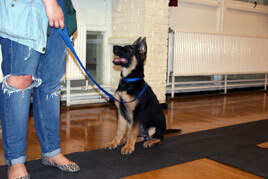 Puppy classes are generally open to dogs from 12 weeks of age through to 20 weeks. After which they would then progress into one of our Teens classes. As with all our classes they are held in a large heated indoor hall on a weekly basis. You are welcome to sit in and watch any of our other classes without your dog. Please ask for times and days.